The restoration of computers like our SAGA FOX LS-1000, containing an EPROM 2708, gave us the necessity of reading, and so storing, the content of this kind of EPROM, before their age can become a problem, wiping out the data stored in them. Common EPROM programmers like the one we have at our Museum can read/write at least 2716, but not the old 2708. Professional tools that can do this task are really expensive. 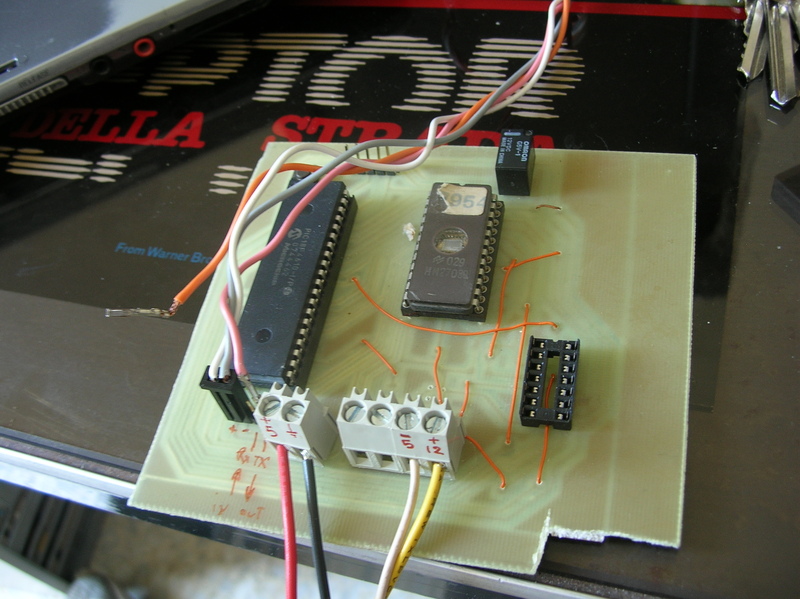 So we decided to create our own 2708 EPROM reader, using a PIC and an external power supply. To read a 2708 eprom we need 10 output for the address bus, and 8 input for the data bus: a total of 18 digital I/O. Moreover, we need a way to transmit data to a PC, so we need other two pin for a serial port. We choosed a 40 pin, 8 bit microcontroller, the pic18f4610. The digital port of this pic are divided into 8 pin digital I/O groups, and their value can be handled as an 8 bit integer. The PIC firmware read the content of every EPROM location (calling read_eprom function with any number between 0 and 1023) and send the content to the serial port. Data is trasmitted to the serial port as an ASCII character, representing the hexadecimal value that has been read. Every byte is separated by a space character. Every 16 bytes, we send a CR (\r) and a LF (\n). Every time the reading restart from the beginning, we transmit the string ‘##\r\n’. Serial port to be used on the PC, speed and connection parameters, the number of readings and the file name to save the dump can be changed editing the header of the Python code. 2704 EPROM are very similar to 2708; the only difference is their size (512 bytes instead of 1024). Pinout is the same but the address bus, that is 9 bit instead of 10. So, the pin 22 , that in the 2708 is the 9th address line, in the 2704 is a ground. For this reason, it’s simple to modify the PIC firmware to read this kind of EPROM. We must simply set the A1 digital port (connected to pin 22 of the EPROM) to zero, and read only the values between 0 and 511. To burn the 2708 EPROM we need to power them as follow: -5V to the VBB pin (21), +12 V to the VDD (19) and the Not Chip Select pin (20), +5V to the VCC pin (24) and set the VSS pin (12) to ground; we also need to initially put the programming pin (18) to ground. At this point we have to simply write on the address bus (A0…A9) the address of the location to program, in the data bus (Q0….Q7) the data to be written, and set the programming pin (18) to +26 V to program it. We need to wait the correct time for the data to be burned (about 1 ms according to the datasheet) and put back to ground the programming pin (18). We are in the process of creating the burning part needed in our circuit board, the PIC software and the corrispondent burning utility in Python. This is not a difficul task, but now we don’t need it in a hurry because, in case of necessity, we can simply change a 2704 or a 2708 with a 2716 or a 2732, just programming their first 512 or 1024 bytes, because those EPROM are pin to pin compatible. The entire project was created by Andrea “Mancausoft” Milazzo. Please write us about any error, missing part or comments! ← New language support enabled!